Each shin guard is padded with EVA high performance RAM-Force™ technology padding and 5 mm anti shock Rev-Tech Gel™ along the front center line to protect your shin. Instep guard is long enough to cover the foot and toes of most athletes. Rev-Tech Gel™ absorbs shock and neutralizes impact to allow you to train for hours without injury. Exclusive Ultra-Lock™ hook and loop closure straps close in opposite directions on the back of your leg to prevent shifting while kicking or checking. Adjustable straps are cushioned for comfort and to prevent irritation while closed tightly. Shin guards are a pre-curved Formfit™ contoured shape so there is no need to break them in. 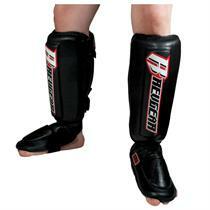 Email your friend about the Revgear Gel Shin Guards. Ask a question about the Revgear Gel Shin Guards.